Head to head graphics comparison against the PS4 Pro, Xbox One X and PC versions of The Division 2. One of 2019’s most anticipated shooter, The Division 2 is finally here. Not only is it an excellent looking game, it also manages to be one of the best, if not the best, looter shooters out there. Featuring a ton of content spread across exceptional map design, The Division 2 is easily one of the standout games that we have played this year. But how does the game perform and runs on the PS4 Pro, Xbox One X and PC, and what kind of improvements have been implemented in the SnowDrop engine since the original Division? Before we move ahead, please keep in mind that The Division 2 features dynamic weather so a one is to one comparison across the three platforms was not possible in some cases. With that in mind, let’s get started. On the console front, we analyzed the game’s performance by taking some sample scenes from the game and running it through trdrop, an open source software. Note that this tool gives us a mere demonstration of the game’s performance, because an exact 1:1 representation of performance can only be provided by the developers themselves since they have access to vast of array of tools and profilers. The Division 2 targets 30 frames per second on both the PS4 Pro and Xbox One X, and according to the tool, the game sticks to that target. Even by doing a manual observation, the game doesn’t seem to be dropping any frames at all, except on the PS4 Pro where in a rare case the frame rate dropped to 29. But largely speaking, you can expect a solid 30 frames per second across the board on both consoles. On the resolution front, things are a bit interesting. Both consoles use temporal anti-aliasing which does an okay job to reduce the jaggies on both consoles (more on this later), but there seems to be a dynamic scaler in place. Xbox One X seems to hand out a native 3840 X 2160 resolution. We are not sure whether there are other scenes which render at a lower resolution but regardless, this is a big improvement over the dynamic 1080p resolution offered by the original Division on the base Xbox One. On the PS4 Pro, however, there is definitely dynamic scaling happening which renders the resolution up to 4K. As mentioned before, both consoles use TAA to smoothen out the edges of various objects in the game’s world, however its implementation seems to be a bit of mixed bag. Object edges on both PS4 Pro and Xbox One X look off at times, specially on the former, thereby hurting image quality by a bit. Now let’s take a look at how the PC version of The Division 2 performs. To begin with, our test PC includes a GTX 1080Ti, 16GB of GDDR4 memory and Ryzen 1700 CPU. 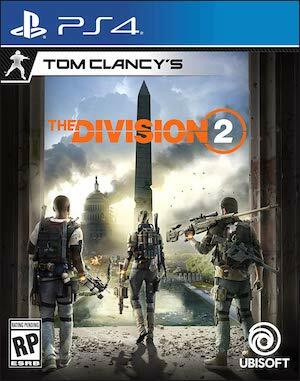 The original Division featured one of the most comprehensive lists of graphical parameters and the trend continues in The Division 2. The PC version includes options such as frame rate limit, shadow quality, spot shadows, spot shadow resolution, resolution scale, sharpening, particle detail, volumetric effect, particle detail, volumetric fog, ambient occlusion, reflection quality, vegetation quality, sub surface scattering, anisotropic filtering, terrain quality and a few others. There are a couple of things we wanted to point as far as settings goes. First of all, the game implements DX12 and it does a fantastic job of improving overall performance and lastly, the resolution scaling is only limited to 100%, so you can’t scale it to something like 200%. On the performance front, we had absolutely no problem at all running at 60 frames per second. This is a solid PC port by the developers with amazing overall graphical quality and a rock solid performance. The difference between consoles and PC is simply put remarkable at times. First of all, there seems to be some sort of a memory issue with regards to streaming assets within the SnowDrop engine. Certain objects, textures and even NPCs won’t load for a few seconds. The worst offender is the PS4 Pro version wherein the pop in issue is absolutely terrible at times. The Xbox One X does a better job at asset streaming but it too struggles with object loading during some instances. Our test PC on the other hand had extremely limited streaming issue but pop in can still be observed if you look closely. This issue is clearly related to the amount of memory each hardware has. The PS4 Pro is the worst in this regard since it has only 8GB, followed by 12GB in Xbox One X and finally our PC which has 16GB. The level of detail and shadow quality are much higher on the PC compared to the PS4 Pro and Xbox One X. Furthermore, the PC version also benefits from higher quality screen space reflections. With the comparisons out of the way, we wanted to talk a bit about the SnowDrop engine and the improvements the developers have implemented, if any, since The Division came out in 2016. Back in 2013, Ubisoft released a video showcasing the potential of the SnowDrop. It was clearly a look into the future of video game graphics with a high end showcase of dynamic material shaders, volumetric effects and weather effects. Unfortunately, very few of those effects got translated into the original Division. Even with The Division 2 these kinds of effects are still largely absent but what we have is a set of subtle changes and improvements that fans of the series will appreciate. The very first thing you will notice is the drastic change in environment textures. Environmental assets like buildings and objects feature higher texture quality compared to The Division, The Division was set in the winter season, so snowfall was a common appearance in the game. This has been replaced by a more vivid and colorful environment full of foliage and a bit of animal life. There also seems to be an uptick in the amount of detail across the environment with tons of debris scattered around. This helps in creating a depressing look and feel, an important element for a post-apocalyptic game like The Division 2. The lighting was already a strong point for SnowDrop and it seems that next to no changes have made in this department. 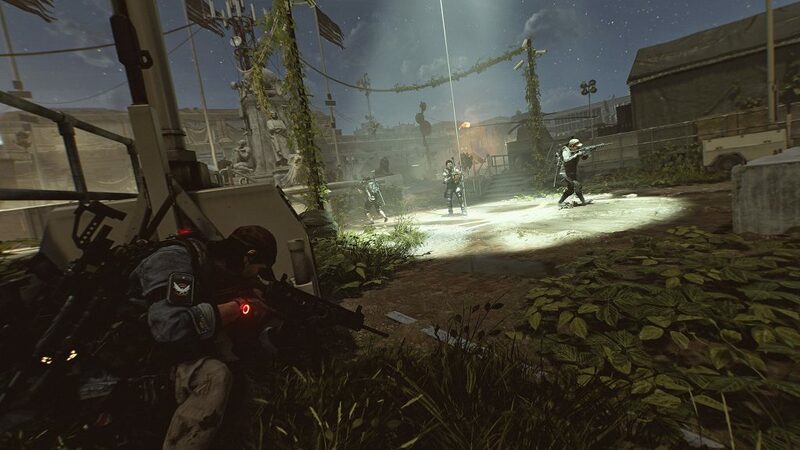 As known already, The Division 2 is mostly set in the summer compared to the original’s winter season, so material shaders of various assets such grass and tress result into vibrant physical lighting. The lighting effect in both games look superb and it seems like it will be a matter of preference for players. Next up is the Snowdrop engine’s capability to render dynamic weather. 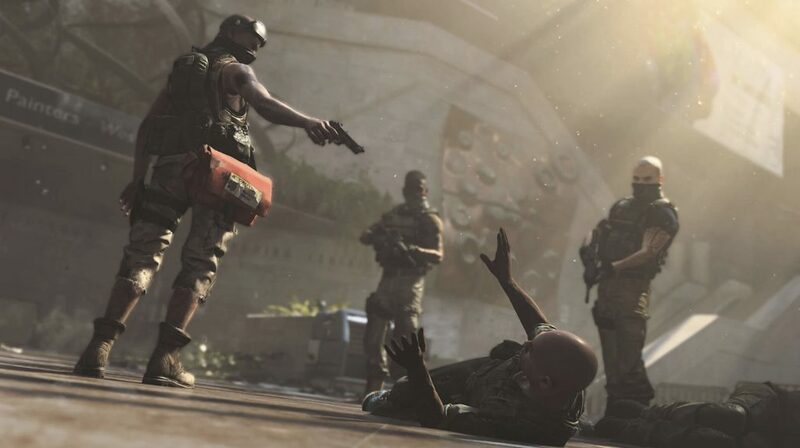 Both games feature aggressive weather changes so be it a drizzle, thunder storm, sunny weather, The Division 2 manages to handle it as good as the original. And lastly, the terrain now features material shaders and parallax occlusion resulting into depth effects and reflection properties for mud surfaces. In comparison, the terrain in the original Division was slightly flat in nature due to it setting. In conclusion, the developers have implemented subtle improvements in the SnowDrop engine, however the animation and streaming issues could be distracting for console owners. In terms of which platforms plays The Division 2 best, it’s clearly the PC build that takes the lead here with a massive margin. Between the consoles, the Xbox One X and PS4 Pro version are largely similar, but the X’s better resolution and the less severe pop in issue makes it stand out. But regardless of the platform you want tp play the game on, you can’t go wrong with the game’s performance and a solid adherence to its frame rate cap.